There was celebrating in Rock Island on June 3-5, 1913, when hundreds of Elks from across Illinois came to their 10th Annual State Convention. Local Lodge 980, five-hundred strong, with a waiting list of potential members, hosted the state delegates at their lodge at 111 18th Street (now home of the Blue Cat Brew Pub). The Harms Hotel just across 18th Street served as headquarters for the conventioneers. Most of the visiting “Bills,” as Elks called themselves, arrived by trains and were greeted at the depot by a band. The block of 18th Street between First and Second Avenues was closed and decorated, creating a “Court of Honor.” On the avenues at either end was an archway “supported by pillars with green foliage and purple flowers” while “myriad electrical bulbs” were hung along both sides of the street. Centered in the court, in front of the Majestic Theatre, a mounted elk, which had been moved from the Elk clubroom, stood atop a white pedestal. Behind the south-facing elk a bandstand was constructed and kept in use during much of the three day convention. After a first-night concert in Spencer Square, the 20-piece Stroehle’s Band played from that bandstand twice each day. Later each evening, another concert, followed by a dance, was held for Elks and their wives at the Watch Tower Pavilion. The ladies had their own headquarters at the Rock Island Club on 19th Street. Although races for state officers were said to be hotly contested, that didn’t stop the Elks from enjoying Rock Island and its surroundings. While many attended meetings, others took a tour of the Tri Cities, followed by a reception at Rock Island Brewing Company near 30th Street. On another day, the afternoon featured horse racing at Exposition Park south of 18th Avenue at 9th Street. Storekeepers got into the Elks mood, too, selling all sorts of memorabilia from Elk tie pins to Elk collars. Major Chicago newspapers sent reporters to cover the convention and, incredibly, there was even a moviemaker. B. E. Newman of Advance Motion Picture Company, Chicago, came to film the event, especially the parade, which was held on Thursday, June 5. Elks and their bands marched east on Fourth Avenue from 12th Street to 23rd Street, where they turned south to 7th Avenue, then to 20th Street, to Second Avenue, to 12th Street. Once on 12th Street they returned east, this time on Third Avenue, until finally proceeding up 18th Street toward the levee where the steamer St. Paul was boarding for an excursion. Our Real Photo postcard from the Special Collections at the Augustana College Library shows the street decorations for the parade in a view of Second Avenue looking east from 15th Street. Near the center of the picture, the gable roof identifies the Illinois Theatre. Across 16th Street, toward the right of the theatre, is the old post office, which was undergoing extensive remodeling at the time. Next to the post office are five three-story storefronts that were typical of our downtown which were probably built in the 1870s. Particularly intriguing is the two-story corner building at the far right. Although it looks more like a home than a commercial building, it, too, is typical of Rock Island’s commercial buildings, but of an even earlier era, the late 1850s. At the very edge of the photo the lacy iron balcony, which we associate with New Orleans historic buildings, can be seen to curve around to the 15th Street side, which faced the courthouse. All of these buildings have been razed. The south side of the street holds the Royal Neighbors of America Parking Lot and the Centennial Bridge Commission Office, a designated local historic landmark. The north side of the street was lost as the Centennial Bridge and its approaches were constructed. The postcard shows street railway tracks in the middle of Second Avenue under elaborate decorations in place for the convention. What appear to be large wooden trellises interwoven with foliage are attached to light poles and swags of bunting are suspended over the street. 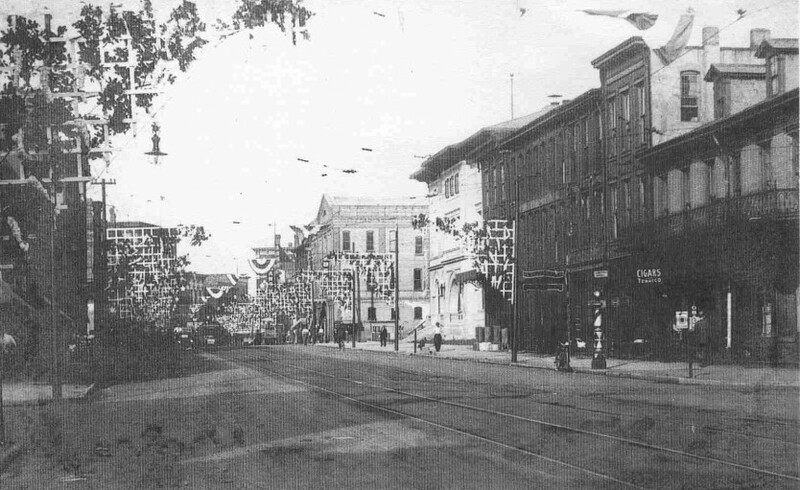 The Argus described the main streets as a purple and white midway of flags and bunting, with more purple and white streamers and pennants. “transforming our sedate town into a riotous blaze of life and color.” Only a day later, The Argus bid “Goodbye, Bill” on its front page, and the sedate town quietly returned. This article by Diane Oestreich is slightly modified from the original, which appeared in the Rock Island Argus and Moline Dispatch on January 16, 2005.